Bob’s Machine Shop’s convertable manual MJ5 jack plate is actually 4 units in one! It can be 2.5″” setback or 5″” setback. And it can have a straight or negative 6 degree wedge. Jacking bolts– allow motor to be moved to any height. No need to take boat out of the water. 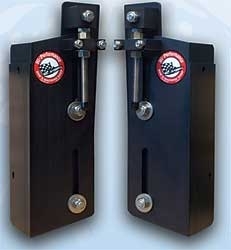 Offset– positions motor 5 1/2 inches behind transom. This allows prop to run in cleaner water, away from the turbulence and bubbles created by the hull. This helps stop slippage of prop, and helps stop torque in steering wheel at high speeds. Trim-In– this allows motor to be trimmed in or down 6 degrees more than if mounted flat on transom. Helps stop low speed porpoising. Balance load better. Light-weight– approximately 25lbs., constructed of aircraft grade aluminum and stainless steel. Anodized– anodized black finish to prevent corrosion. Anodize also lets paint stick to aluminum if painting is preferred. Narrow designed– only inches wide, make this plate possible to fit the narrowest of transoms. Fits V-6– pre-drilled to fit all late model V-6’s. Can be modified to fit any size outboard.